Again, we delve into the realm of imagination. However, I do feel that this Ironforge Guard outfit is more in-line with the actual NPC’s than the Kirina’s Stormwind Guard outfit is. The shoulder armor worn by the Ironforge NPC is custom; although, they would be a welcome addition by many to be included in game. Also, the Red Linen Shirt is as about as close as you can get for the red undertones of the NPC’s outfit. Likewise, the pants having the red “leggings” underneath are also custom for the NPC. 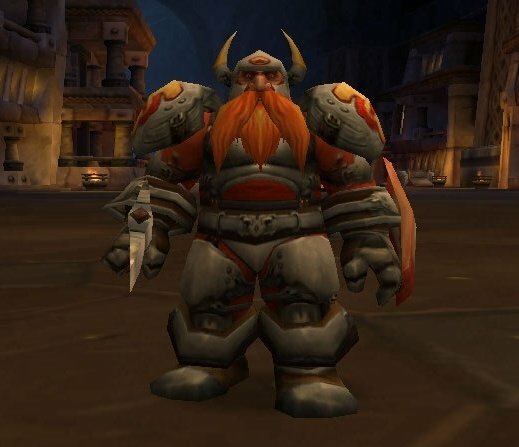 An almost exact match to the Ironforge Guard’s shield, is, as listed, the Dwarven Defender. It is a reward from an Alliance only quest in Loch Modan. Some other shields to consider, however they don’t have the “logo” on it, are the Dwarven Kite Shield (also an Alliance only quest reward), which is the same shape and similar colors to the Dwarven Defender, and the Brigade Defender (random world-drop), which is similar to color, but is rectangle in shape. The Horned Viking Helmet is only obtainable for Horde players, as it drops from an NPC out of Uldaman who is actually an Alliance quest giver. The only alternative I could find that still has that same little red emblem on the front is the Frost-Worn Plate Helmet. However, there are similar “horned” styles of helmets, without the emblem, to consider if either one of these are not obtainable for someone. 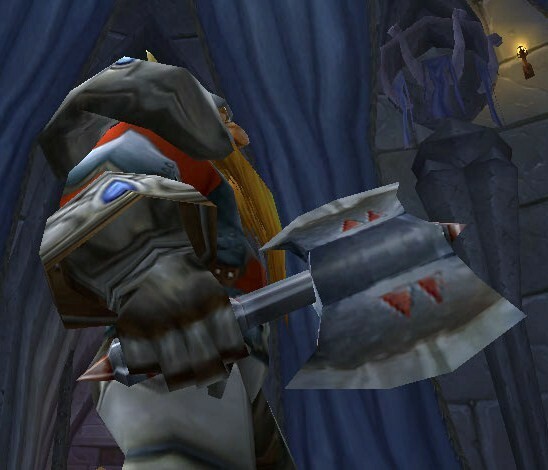 The Callous Axe is one of the few axes that has a matching red design to that of the NPC’s. It is sold by a few vendors in limited supply. Another alternative is the Biting Axe, which is a quest reward from both an Alliance and Horde quest out in Dustwallow Marsh. Again, there are the same style of axe that can be used, although one would be sacrificing having the red design. The Grimscale Belt can be replaced for the Field Plate Girdle, which is more of a better match to the one worn by the Ironforge NPC. The Grimscale Armor can be replaced for the Ironforge Breastplate. This plate chest-piece is crafted; however, Horde blacksmiths are not able to accept the quest to receive the plans to make it, as it is Alliance only. 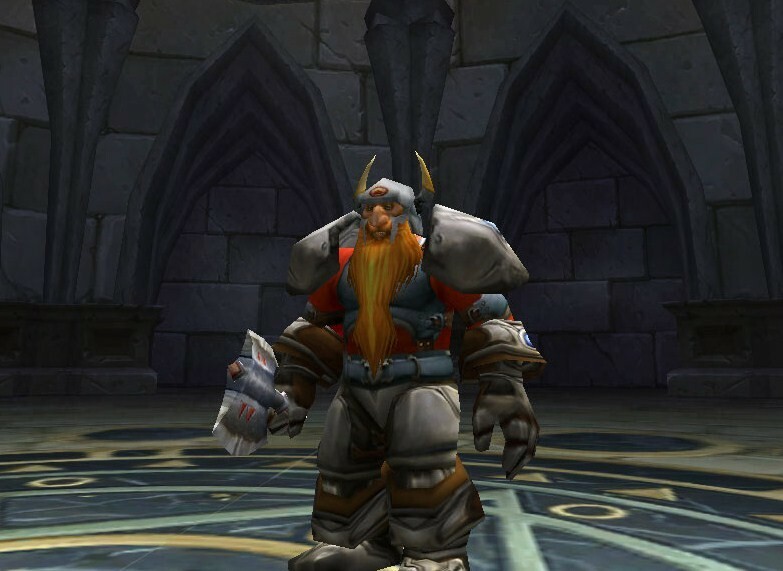 Want to show off your Ironforge Guard’s outfit? Do so on the forum – We’d love to see it!